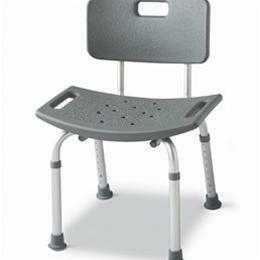 The Adjustable Aluminum Bath Stool with Backrest is for people who may need to steady themselves, sit down, or reach their feet. Simple assembly leads to a strong sense of security in the Tub or shower. Thick rubber feet prevent it from sliding around and the height is adjustable. Stainless steel hardware and brass inserts.